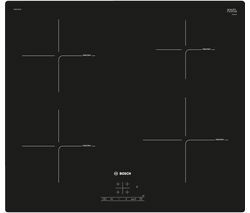 Bosch provide a wide selection of sleek hobs which are both gas, in black and silver stainless steel, and electric, in black ceramic. 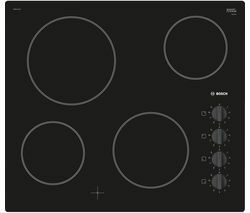 Many of the ceramic electric hobs feature touch controls, so no need to worry about greasy knobs. They also feature sensor/child lock technology to prevent accidental switching of the controls. The Bosch hob collection features gas hobs, such as the Serie 6, with five burners, giving you even more freedom in meal planning and preparation as well as a choice of either manual or automatic ignition. Quick-therm technology enables electric Bosch hobs to heat up faster, so you can get straight to cooking without waiting around. Residual heat indicators allow you to see at a glance if a cooking zone is still hot. The frameless design of these hobs means that clean-up is just as quick. In fact these practical, intuitive hobs are designed to ensure that whole the process of cooking to cleaning is effortless and pleasurable. The Bosch PCQ715B90E Gas Hob features five burners, consisting of two standard burners, a high-speed burner, an economy burner, and a high-speed wok burner, with enough room for you to get creative in the kitchen. To browse all gas and electric hobs take a tour of our complete collection, featuring the latest Neff hobs, which are just as modern and sleek to look at. Models like the T58FD20X0 feature a FlexZone, allowing you to place your pots wherever you want to in order to optimise your space usage and efficiency. See our Smeg hobs for more expertly crafted kitchen appliances.